If you have a $140 Philips alarm clock with an integrated wake up light, you obviously know how great these things are. They wake you up more gently than a standard alarm clock and you have more energy all day as a result. If you don’t already have one, we actually don’t recommend buying a Philips model despite the fact that it’s worth every penny. Why not? 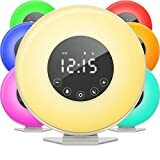 Because the hOmeLabs Sunrise Alarm Clock is almost the same thing and it only costs $20.